After being down most of the day, I finished on a very strong note in my third session of the day and was up almost $500 from my low point. Today was by far the longest poker day I’ve put in – over 7.5 hours which turned out as 4087 hands. It felt pretty good, but I’ll sleep well. Here’s a graph that shows exactly how my day went. It’s one of the tools I use to track my play. Hands played are on the X axis, and $$$ are the Y axis. Enjoy. These past few days have been rough. Yesterday started with me flopping 4 sets, only to lose to 2 gut-shots, an open ender, and a flush that all came on the turn. Brutal. Then there was the AA vs. JJ and the flop was JTT. Stacked again. Then my KK vs. AA twice. Sheesh. But that’s poker…and you gotta be ready for it. I was prepared…ok, mostly prepared. I only hit my desk once. But I don’t think the desk liked it very much. In the last 3 days I’ve played 5300 or so of poker. And I’m down $75. This is actually great news given the above stretch of unfortunate luck. As an example, today, my low point was 1700 hands into my session and I was down roughly $300. I managed to end down $14 for the day (and I might still play tonight). The very last hand of the day was quite interesting. I had 44 and called a raise from a fairly tight aggressive player. The flop was A45 with 2 spades. Perfect. I bet on the flop, turn, and river and he called all the way. The final pot was just over $150. He had AK. That’s pretty close. In fact it’s about one half of one second off. Last night was the 25 billionth hand dealt at Poker Stars. They of course were giving away sweet prizes. $100k if you won the 25 billionth hand along with 50k in tourney entries to major events. So I was playing my regular 6 tables, and then ramped up to 24 tables for the last million hands before the big one. And I just missed. I definitely felt like I was spewing money during this 40 minutes, but I ended up only down $38 for the day. I’ll pay $38 for a chance at 150k any day. I had about a 1 in 500 to 1000 chance of winning as I didn’t see exactly how many tables were running. My closest hand afterwards was 25,000,000,309. Another fraction of a second. Ugh. Last night I was playing 6 tables of .5/1. Lately I’ve been focusing on getting a good win rate at this limit. Prior to this I was playing too many tables to do well. Now that I’m back to 6, it’s a little boring sometimes, but I feel like my play is so much better and the money is backing up those thoughts. Occasionally I’ll use my FPP (frequent player points) to buy into a 5400 FPP tourney. There are 10 entrants and the top 4 win entry to a $215 tourney. I unregister and take the $215 using it to play other tourneys – typically double or nothings. You start with 1500 in chips and blinds go up every 5 minutes (turbo). Blinds start at 10/20. First hand: UTG goes all-in with A8s and is called by the next player with AKo. Board 68234 and AK is eliminated. 5 players left. Second hand: Button goes all in with 22 and is called by KJo (same player who won the first hand). Flop is 525 and the button doubles up. Still 5 players. Third hand: Previous winner raises to 150. I’m in the big blind with 33, but fold. Fourth hand: UTG raises to 200 with ATo and next player pushes with 44. UTG calls, but loses when board is K92JJ. Still 5 players unfortunately for me. Fifth hand: I push all-in with A8o on the button and everyone folds. Sweet! Sixth hand: Button pushes all-in and everyone folds. Eighth hand: A dream – I’m dealt AA in the big blind and the small blind pushes all in. I quickly call. Board is KK265 with 4 spades, but neither of us has one, so I win. Ninth hand: UTG raises to 100, CO pushes all in with AKo, and Button calls with J9s. UTG folds. Board is K85QK and we’re down to 4 players. Tenth hand: I push all-in with KTo on the button and get called by the big blind with A8s. The flop is perfect with T24. Turn 3. River Q. I win and he’s out. I have almost 1600 chips and am sure to make it. Eleventh hand: I am dealt A7o, but it’s folded to me in the big blind. I’ll take it. Twelfth hand: Button raises to put big blind all-in for 240 with A2o. Big blind calls with T8o. Board is 3496K and Ace high wins. Four minutes after it started it was over, and I had won $215. Pretty awesome. Later in the night, I was dealt AQs spades in the small blind of a .5/1 game. It folded to the button who min-raised to $2. I re-raised to $4 to isolate. He calls and the flop is Q5J with the Js. I bet $8 and he quickly calls. The turn is the Ts. I bet $5 and he calls. The river is the Ks. ROYAL FLUSH!!! And in spades to boot. Hoping that he also had an Ace I put him all-in. He folded. Bad play on my part, but with only 3 spades and it being runner runner, he might have called with any Ace. This is my 6th royal flush, and oddly enough it’s been almost exactly a year since I hit the last one. Donkey: One who goes EEE AWWW at the table. Table Selection: Finding the table making the loudest EEE AWWW noise. Table selection can be a difficult task when you are playing multiple tables online. How can you possibly look up all the people at the table when you are already playing at 6-12 or even 24 others? I can’t do it well yet, but have been trying. There are many websites that will tell you which tables are currently the best to play at. I decided to give it a try last night by waiting on the top 6 tables from the site. I sat at the first 6 and did quite well. The tables were .5/1 blinds and in 2 hours, I won over $200. The tables had drastically changed from when I sat down, so I decided to go back to the list and sit at 6 new tables. This is when the fun really started. At one of the tables, there was a person who showed stats of losing 35BB/100 hands. We’ll call him Ted. That’s insanely terrible. As a comparison a GREAT win rate at any game would be 5BB/100 hands or higher. Very few people have win rates above 10BB/100 hands. Ted was raising to $6-$9 on almost every hand. I picked up AA. He limped UTG, and I raised to $5. The button called as did Ted. The flop was T59 with 2 hearts. I bet $10, the button folded and Ted called. The turn was a 9. I didn’t like that. We both checked and the river was another 9. I bet $19 and he thought for a long time and called showing 66. Not a bad call given his cards. About 40 minutes later I picked up KJs diamonds in the big blind. By this point my friend Paul had made his way to the table – the waiting list was more than 10 people long. All to be with Ted. lol. A good player raised to $5, Ted called as did I. The flop was sick for my hand. K96 with 2 diamonds. I checked and the original raiser bet $10, Ted called as did I. I wasn’t ready to give away my hand strength yet. The turn was a Jack. I quickly bet out $33. Good player folds and Ted raises all-in. I quickly call. He shows J9. The river is an 8 and I’m up to $245 from my $100. And I’m just hoping he reloads as he has 4-5 times already at this table. Ted then goes on a run, hitting a few sets and tripling up to have $300 again. This is great for me as I can win a lot more from him. Another 40 minutes go by as I watch the fun, including Paul doubling up from him. I get dealt AQo. Ted raises (like always) to $7 and I call. The flop seems perfect: 69Q with 2 diamonds. He bets $7 and I raise to $14 figuring I have him crushed. He re-raises to $29. I’m not very happy with this but I call. I actually put him on KK or maybe a set here. The turn is an A. I’m feeling very good about my hand now. I just drew out on KK if that’s what he had. With $74 in the pot, he leads out for $101. I push all in for $175 and he insta-calls. The river is an 8. He shows 69 for a flopped two pair and I scoop the pot with my higher two pair. $425 pot – not bad for a .5/1 game. I woke up sick yesterday. And am still feeling crappy today. I certainly wouldn’t have gone in to the office feeling like this, but playing poker when sick is much easier apparently. :) Yesterday I played a whopping 78 tournaments and ended up about $250. I usually play 9 or 10 of them at a time, and the day started pretty bad with several losing sessions of 9 in a row. However, a few hours later things were looking up. So far today I’ve only played 9. I lost 5 of them. Unfortunately for me, this was the bad luck getting me. Here were the 5 hands I lost the tournaments on. All of these were all in pre-flop. KK beat by A9s when 2 diamonds flopped and a third one came on the turn. 33 on T65J3 board beaten by 74o. I had a SET on the river and still lost. Ugh. Q9 on 4Q342 board beaten by A5o. This isn’t so bad, because I had such a short stack so many people called. I’d have preferred to see an Ace on the river to lose this one. Anyway, just a sample of what can and does happen frequently. I haven’t seen my pair beat two over-cards in an all-in for quite some time. It’ll happen over time though. Even though I’m not feeling well, I’m definitely enjoying playing and trying to figure out exactly where to focus. I’ve started reading my poker books again and am already learning. It’s been a pretty busy and tiring month. I managed to pack up my house, close the sale, drive to Vegas, get settled in a rental house, have my stuff arrive with the moving company (well most of it anyway), got a little sleep, and started “living the dream”. As many of you know I was likely going to try for Supernova Elite. This requires earning 1 million VPPs (think of them like frequent flyer miles). It’s a pretty tough road but I’m sure I could do it. After a lot of thinking, I decided to postpone this for a year (and maybe forever). If I’d have moved and been here by November, I might have tried it, but frankly I just need to relax for a little. February might actually be a little more of the same. I’m sure I’ll play more poker, but I’m not sure it will be at “full time” capacity until March. Ramping into the lifestyle is probably a good idea anyway as opposed to just starting to play 8 hours a day or more 5 days a week right away. As a part of “running my business” of poker, I do a monthly business report. In summary, January was a good month (in reality it was at best a half month for playing poker – I somehow managed to play at least a little poker on 19 days of the month). I won $1588.80 and earned 4074 VPPs. I actually won over $2k in tournaments but lost in cash games for the month. I played 287 tournaments and made the money in 157 of them. I’m pretty happy with this and will continue to play more of these tournaments moving forward. (And I thought I was just a cash game player… :) ). 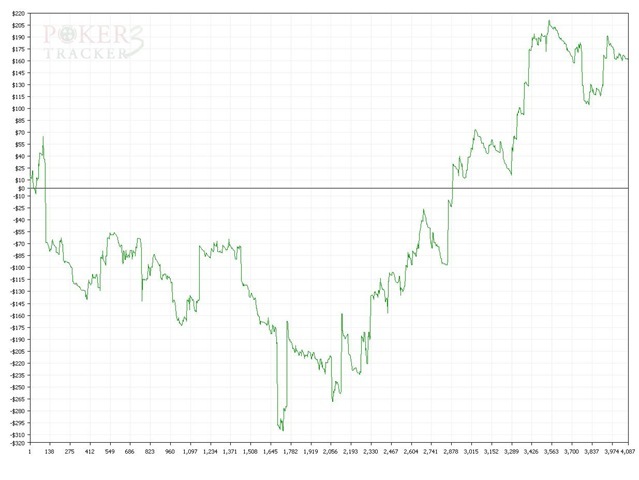 In my cash game play, I’ve been working on being more aggressive and saw a jump from 8.77% of hands won to 10.13% won. I’m definitely happy with this and hopefully it will continue as my sample size is a bit small to make any conclusions yet. I’ve also set my goals for the new year for poker. I have two categories Poker Play and Poker Study. I won’t post all of the goals but here’s a quick run down of the major points. In poker, it’s not usually good to set a monetary goal, but I’m hoping to make at least $60k this year, while also beating the .5/1 for at least 2BB/100. I will make Supernova (only need 100k VPPs). I’ve also set a goal of playing live for at least a week at 6 major casinos to try out the different poker rooms. And as noted in the previous post, I accomplished one of my goals by playing on the PokerPro tables already. For the poker study goal, there are many articles, books, and online forums I will read (as well as posting to the online forums to help myself learn and grow). I will be reviewing my results weekly as well as reviewing my hand history to find ways to remove leaks from my game and extract more money out of winning hands, and lose less in losing situations. I would like to find a poker mentor at some point during the year. Another part of this goal is making sure my online set up is comfortable and as easy as possible to avoid any RSI issues. Hopefully everyone enjoyed the Super Bowl yesterday (even though the Cardinals lost). Oh yeah, and for those of you in Office Labs, I showed pptPlex to a friend who was working on a college assignment yesterday and she LOVED it. That was pretty cool to see – props to JJ, Jonas, Eli and others who made that a reality.